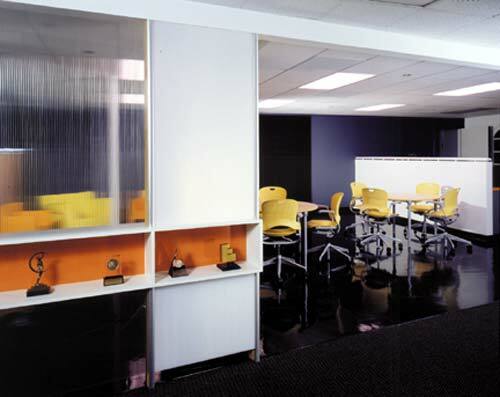 San Diego, California: A typical 80's office maze is transformed into a creative, collaborative environment. “It’s about work that moves people from indifference to action. Confusion to clarity. Thinking to feeling.” So claims advertising agency Campbell Mithun’s Web site. It also describes the transitions the agency’s San Diego office recently experienced when the remodeling of its 18,000-square-foot space was completed this past February. The Minneapolis-based agency purchased acquired San Diego’s Phillips Ramsey more than two years ago in a West Coast expansion,. its 18,000 square footThe office space was a typical 80’s office structure – a maze of isolated compartments with no common teaming areas – , and brown, very brown. New business meetings for the ad agency were usually held outside of the office because “frankly, it wasn’t us,” says Gary Meads, executive vice president and general manager of Campbell Mithun’s West Coast office. Moreover, since the space was so quiet and departmentalized, employees often stayed in their offices and worked, instead of forging spontaneous creative collaborations. New business meetings for the ad agency were usually held outside of their offices, because frankly “it wasn’t us,” said Gary Meads, executive vice president and general manager of Campbell Mithun’s West Coast office. Moreover, employees often stayed in their offices and worked, instead of forging spontaneous creative collaborations, because the space was quiet and departmentalized. Meads Meads called on The McCulley Group to help. He charged The McCulley Group, the Solana Beach, California-based Solana Beach, Calif. design and branding studio, with opening the workspace up, and making it “cool”” and and contemporary – and creating a place where staff members are would be encouraged to work together. John McCulley and The McCulley Group staffhis team offered an additional charge – to create a workspace that would communicate Campbell Mithun’s core values to employees, clients, and stakeholders at every point of contact. 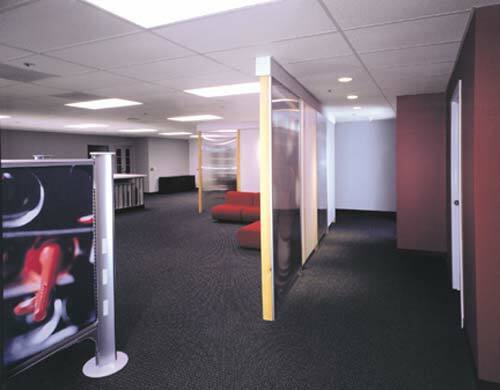 The dynamic transition from 80’s maze to dynamic collaborative communication tool was sprung by a dramatic color palletepalette to inspire creative “fire.” Each of three “zones” in the workspace are strategically colored corresponding to the creative juice activity in the area, red being the most creative. The reception area is Campbell Mithun’s corporate yellow (also in their logo), account management is orange, and appropriately, the creative department is a fiery red. “Since the remodel, I’ve noticed that some people dress differently and behave differently. They wear more e red in the red zones and more orange in the orange zones. It’s bizarre,” saysid Meads. 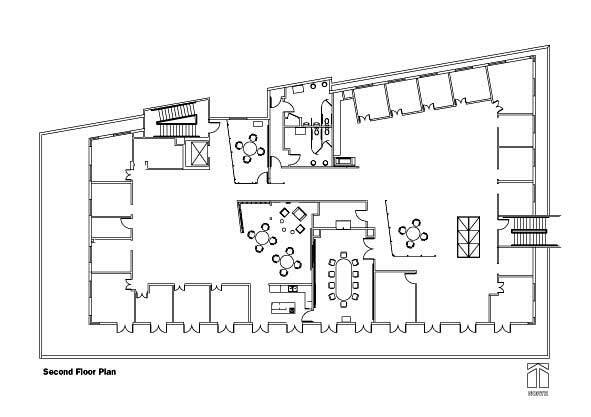 In response to the need for better communication between account management and creative departments, offices for both line the perimeter of an open gathering space with pockets of comfortable couches and conference tables for informal meetings. Mobile white boards offer employees visual tools during brainstorming sessions. Throughout the space, graphics on the walls tell the story of Campbell Mithun’s clients, with large Ppop Aart-like images. 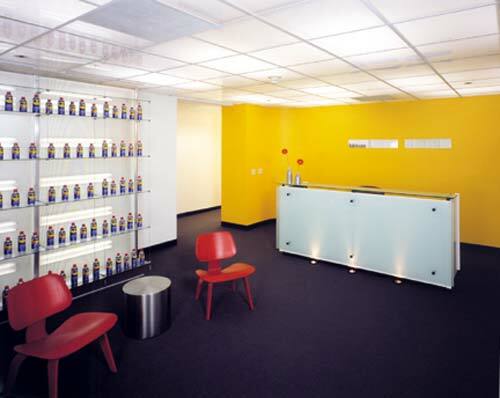 A sea of red caps for WD-40, a close up of a giraffe’s neck for the San Diego Zoo, close cropped playing cards for Pala Casino –, all line the walls of are present graphically throughout the offices. 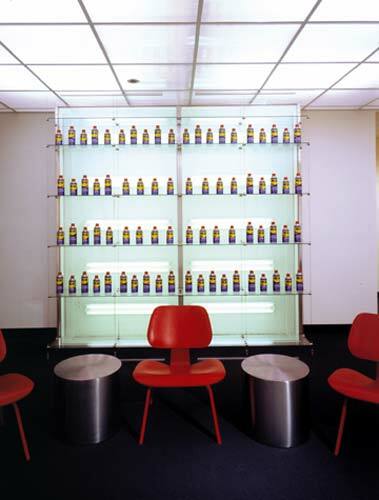 In the lobby/reception area, a display of actual WD-40 cans turns a hardware mainstay into an Andy Warhol-like art installation. The McCulley Group team began the process of redefining the space by working with Campbell Mithun to examine business objectives, define their present culture and determine what they would like their culture to be. From there, they defined their brand – smart, casual and efficient -- and developed a visual landscape that embodied that identity. “Campbell Mithun’s workplace is among the greatest communication tools the company has, right along with the corporate collateral and website,” said John McCulley. dDesign tTeam includes: John Riley McCulley (P, principal -in- Ccharge),; Jeff Haack, d(Design Ddirector),; Ane Rocha,, interior designer; Autumn Miner, interior designer; Manda Durham (I, interior dDesigners), and Julia Spengler, e(Environmental gGraphic dDesigner.) Johnson & Jennings was the general contractor, with Gary Meads, executive vice-president and managing director of Campbell Mithun, acting as project manager. Since 1987, The McCulley Group, in Solana Beach, California, has been committed to creating branded environments that strategically integrate business goals with design to help organizations thrive. Clients include California Bank & Trust, Cox Communications, Jack-In-The-Box, Four Seasons Resorts, Burnham Real Estate Services, and Amtrak. Kim Lande is a freelance writer based in Cardiff, California, who frequently explores design and architecture. Campbell Mithun's lobby/reception area features a wall painted in the agency's signature yellow that is also central to their logo and graphic identity. 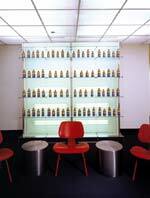 The backlit arrangement of WD-40 cans (one of the ad agency's longtime clients) is an Andy Warhol-like Pop Art display. 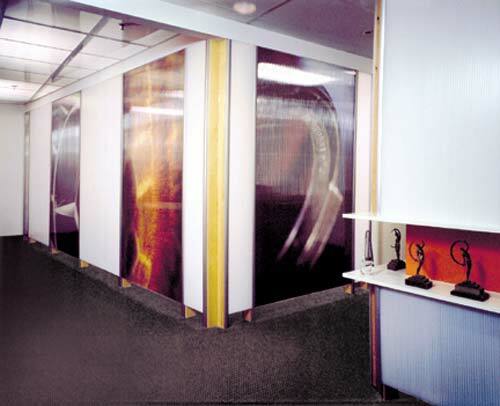 Corridors are lined with interchangeable graphic panels representing the agency's clients such as the San Diego Zoo and Pala Casino. 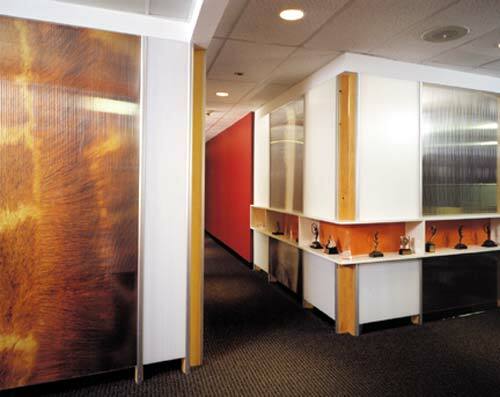 Display cases are built into the corridor walls to showcase awards and artifacts. 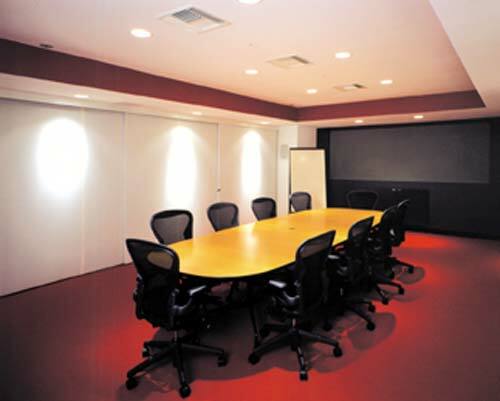 The break room/kitchen area is designed for intimate conversations or group meetings. Mobile white boards are always accessible for impromptu brainstorming sessions. A state-of-the art conference room provides tools for maximum creative collaboration, with white boards on the walls and retractable audio-visual equipment. An open gathering space includes pockets of comfortable couches and conference tables.